Except the other werewolves don’t believe this is any ordinary winter, and they’re coming down over the Wall to mark their new territory. Including Danny’s ex, Jack—the Crown Prince Pup of the Numitor’s pack—and the prince's brother, who wants to kill him. One of the things I enjoy about male/male shifter romances is that you never know how a pack is going to react to a m/m pairing until you actually read or listen to the book. The genre provides a range of completely accepting packs to those that will kill or exile the “abomination.” In Moore’s Dog Days, it’s not quite so clear cut because Jack’s exile isn’t strictly because he prefers men, but more because he’s exclusive to men, refusing to procreate with a female AND because he has a twin brother, Gregor, who is willing to mate to produce an heir. In fact, I got the feeling (and this is where I think I would have benefited from reading the book) that the twins’ father had to name an heir and then exile the other son, and Jack’s not-quite-so-fluid sexuality made him the obvious choice for exile. Perhaps making Jack’s male-only preference worse is that his attention – at least for a while – belonged to a dog shifter rather than a full-blooded wolf shifter. While the opening chapter seems to focus on Jack, Dog Days is actually Danny’s story. Unlike most wolf and dog shifters, Danny doesn’t want to be part of pack, preferring to live among humans, attending school and working as a human. But Mother Nature has turned everyone’s world upside down – both the humans and shifters – and Danny finds himself pulled back into a pack when Jack shows up to warn him of the Wolf Winter and the Numitor’s plans. To make matters worse, victims of fatal animal attacks begin to show up within days of Jack’s arrival… and so does Gregor. When Danny and Jack discover that Gregor isn’t the one framing Jack, things go from bad to worse to deadly as they must fight an unknown enemy who seems to be as hellbent on killing them as Mother Nature does. Although I referred to shifter romances earlier, Dog Days is more focused on the conflict and action than it is on the romance. It’s actually a bit on the grittier side as Danny gets caught in the middle of Jack’s fight with his brother, as well as another entity who seeks to rule over the shifters, all while trying to survive apocalyptic weather conditions. I can’t say there weren’t feelings between Danny and Jack in the beginning of the book – after all, you generally have to have some degree of love for a person for them to be able to exasperate you much as they did one another – but I’d be hard pressed to say that they were in love. And while there was some definite relationship development over the course of the book, the most obvious being towards the end, I’m still not sure that they were in love by the end of the book – at least not in the traditional romance novel manner. To me, it felt more like a relationship that forms when a mating bond occurs between two close friends (with benefits). There’s a definite shared history there and strong feelings for one another; and while there may be love between them, they’re not to the point of being in love with each other – if that makes sense. I actually found Jack and Danny’s relationship to be refreshing and felt it went well with the overall feel of the book. While I loved how the author left the ending open in such a way that a sequel could be written but isn’t necessarily required, I WANT A SEQUEL!!! I want more of Jack and Danny and yes, even Gregor… especially if Derrick McClain is narrating. After eight years of professional and competitive public speaking and (live) oral interpretation of literature, Derrick has turned his powerful voice to the world of audiobooks. Derrick records in a professional quality studio at his home in Tallahassee, FL, where he enjoys the quiet North Florida lifestyle along with his fiancé and insanely hyper dog. He has previously lived in rural Pennsylvania as well as Orange County California, and has extensively traveled the United States, becoming familiar with a wide range of American accents and sub-cultures. 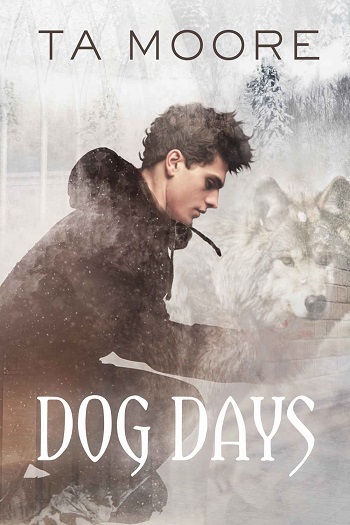 Reviewers on the Wicked Reads Review Team were provided a free audiobook copy of Dog Days by TA Moore, narrated by Derrick McClain to listen to and review.